I practically had to toss a coin to figure out of the two great things today, which I would talk about first. And, it came down to photos. So, I’ll chat about the great thing with good photos first. 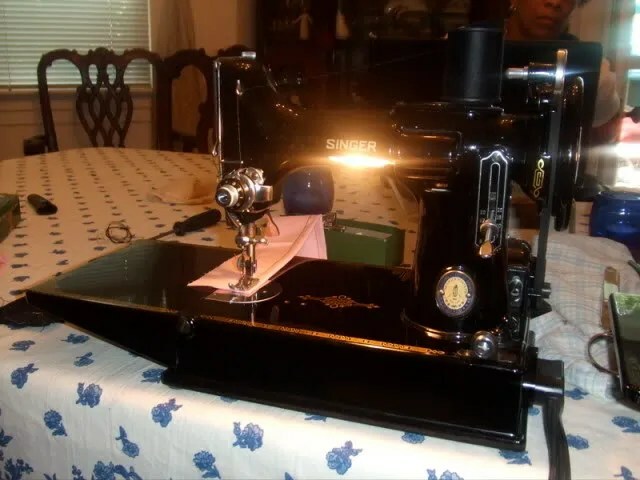 I finally got a Singer 221 Featherweight!! And, it does sew just as beautifully as they say. And, I do a killer happy dance!! Blog reader Melodye tipped me off that one was on Craigslist for a 1/4 of the going rate within 20 mins of me. Actually this is the second one she let me know about, but the first time I was in Seattle. I emailed the woman Thursday night, looked it over on Friday morning and picked it up today. Her grandmother first got it in Christmas 1954. Then it was her mom’s. And finally, it became hers. But, she already had a machine and it was ‘just sitting in the basement’. My friend Kristy and I (who got her beautiful Centennial edition above all perfect and unused in the trash of all places) went to work at it for about an hour today to get the bobbin area cleared of horrible thread snarls. Now, it’s fabulous! I’ll do a size comp with my Kennie 1040 soon. So, that brings my machine count to…five. Four vintage. All loved. Seriuosly, I was talking to the Featherweight. The second awesome thing was that I met up with Lisette today from La Cubanita Cose (which I always say is my favorite sewing blog name)! We went to Ikea to see the ‘Sew Me What You’ve Got Fashion Show’. I’ve got a lot to say about that, but want to organize my photos better. Lisette though, was awesome. Funny, smart, charming and wearing a great BWOF skirt that I didn’t get a photo off. My pic above is awful, so I’m hoping hers was a little better. And, here’s a teaser for my next post on the actual garments from the fashion show. More soon, I promise! Congrats on getting your Featherweight! I’m sure you two will be very happy together! 😉 I’m looking forward to seeing your pics from the fashion show. Congrats. Now wait until you have to have one in each color! I have a black one I inherited (1954 model) and a white one and a 222 freearm. Only one really left to buy is a tan model. Someday…. woo hoo on the featherweight. Melodye is your secret angel. I’m so glad I was able to help. It’s a match for mine and you will love it. It sews a perfectly straight stitch. Enjoy!! eek! ooh too fun things! 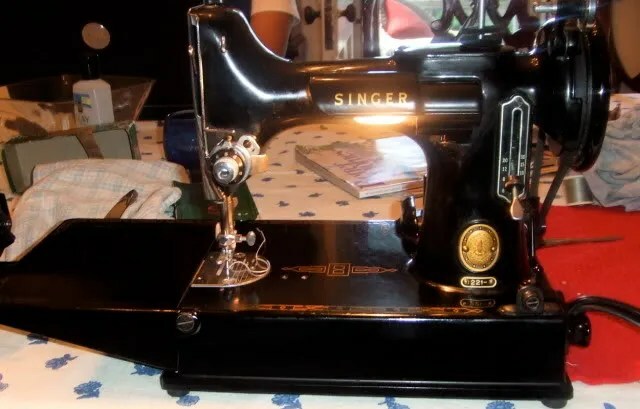 That machine has a shine to it, like its a gift from the sewing goddesses! and the fashion show…cant wait to see the rest! I want one too! Congrats on getting it and getting it and getting it up and working. I notified my husband, the ebay maven, that he should be on the lookout for one. Great find and in such good condition too! It’s beautiful. I’m so jealous you met Lisette!!!! That is one awesome day! The 221 is gorgeous and can’t wait to see the garment photos. You of all people deserve that machine. Congratulations! Congratulations on aquiring the Featherweight. I bought mine for $25, case, accessories, owner manual–in perfect condition. Obviously, someone didn’t know what they had! It’s a great little machine. Congratulations on bringing home your featherweight. I was lucky to inherit my mom’s featherweight when I was 17 and just starting to sew. I used that machine until mid-university, when I upgraded to a modern machine. I love my featherweight – it sews the best straight stitch and it will power through anything – layers of denim? no problem! You will love your new machine. I am so jealous that you got to hang out with Lisette – she is so cool. But, I’m also jealous of her, because she got to hang out with you! Gorgeous machine! Can’t wait to read about the Ikea fashion show — love the prints they have. I am SO SO jealous! I was haunting criags list for a while, but gave up. Maybe this summer I’ll re-enter the hunt. Congratulations though. And thanks for the pix on your IKEA post. It’s a few hours to IKEA from here, but I think I’d be willing to make the trip to get that aneboda chest. And I tagged you on my blog. Yay! I love love love my featherweight. Congratulations on the Featherweight!!! I just got back from taking a one day seminar on cleaning, dis-and assembling, and cleaning the FW. I’ve wanted to do that for so long. My mom also got rid of her FW that I learned to sew on, but she had no medical excuses. Goodwill got ours. I found out months after the fact 😦 So…I had to get one of my own. It’s not in great cosmetic shape, but it sews like a dream like they all do.